tdbcelts.org - Céad míle fáilte! Board index Céad míle fáilte! The Tuatha de Bhriain is a re-creation society founded in 1986 that attempts to re-enact the spirit and material culture of 5th century Ireland. While we are not officially associated with the SCA (Society for Creative Anachronism), several of us are also members of that organization, and attend some SCA events. We are a group of like-minded individuals most of whom live on Long Island, in New York. We hold 3 events each year on or near to the ancient Celtic Holidays, two of these are weekend camp outs while the third is a day long indoor event. 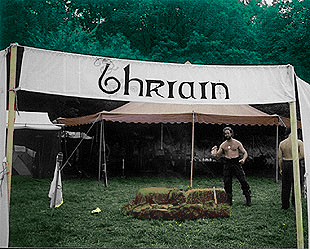 We attend the Pennsic War as a group and camp in the bog near Norseland, Prechainn, Silver Phoenix, and Estmar. Four official planning meetings are held in between our events, and members have been known to host mundane gatherings like beer tastings, sausage making parties, music sessions, and hammer-ins. Many of our gatherings are planned with the goal to prepare in some way for the next event, including more official 'work party' details. As re-enactors, we endeavor to re-create the atmosphere of our chosen time period as best we can. This includes wearing period clothing, eating period foods, practicing period crafts and customs, using period technology and tools, and interacting with each other as the people of our chosen culture would have. You can check out our Photo Gallery (separate registration required) for a better glimpse at what we do. The key elements of our hobby are imagination, effort, and the vast amount of research found in learned texts and archeological journals. It is a challenging yet highly rewarding hobby, as well as out-right fun! If this hobby sounds like something you would enjoy, check out our How To section to find out more about the possibility of becoming part of our clann. If you are far from our area, or interested in a different culture, you can still join into our online discussions as a website member. We try to keep this site geared to period pursuits, but we also maintain a more mundane mailing list if you just want to chew the fat.